The Federal Communications Commission on Thursday approved regulating the Internet as a utility in a 3-2 partisan vote, handing a big victory to Net neutrality proponents who lobbied for a decade for tough rules to protect consumers. The FCC’s action forbids telecom companies from blocking websites, and slowing or speeding up some Internet traffic. This means that all Internet streams should be treated the same, or neutrally, without preferences. The FCC also voted to make it easier for municipally run Internet providers to expand and compete with Comcast and other private telecom companies, a move lauded by activist groups. WASHINGTON (Reuters) – President Barack Obama scolded congressional Republicans on Thursday, hours after a fiscal crisis was narrowly averted and called on his opponents to help repair the economic damage caused by a 16-day U.S. government shutdown and a close brush with a debt default. Obama stressed that he is willing to work with lawmakers wherever they can agree, but the tone he struck amounted to a rebuke of Republicans, whom Americans largely blame for pushing the United States to the brink of an economic calamity. “The American people are completely fed up with Washington,” said Obama in a White House speech attended by many of the aides who worked day and night through the various stages of the latest fiscal stalemate. WASHINGTON — President Barack Obama has directed the Pentagon to develop an expanded list of potential targets in Syria in response to intelligence suggesting that President Bashar Assad’s government has been moving troops and equipment used to employ chemical weapons while Congress debates whether to authorize military action. Mr. Obama, officials said, is determined to put more emphasis on the “degrade” part of what the administration has said is the goal of a military strike against Syria — to “deter and degrade” Mr. Assad’s ability to use chemical weapons. That means expanding beyond the 50 or so major sites that were part of the target list developed with French forces before Mr. Obama delayed action Saturday to seek congressional approval. MOSCOW (AP) — President Vladimir Putin hopes to send a delegation of Russian lawmakers to the United States to discuss the situation in Syria with members of Congress, the Interfax news agency reported Monday. Russian legislators Valentina Matvienko and Sergei Naryshkin proposed that to Putin, saying polls have shown little support among Americans for armed intervention in Syria to punish its regime for an alleged chemical weapons attack. The lawmakers said maybe U.S. legislators can be persuaded to take a “balanced stance” on the issue. Putin supported the initiative, which would require formal approval by the Foreign Ministry. 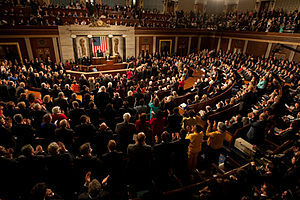 Russia has sent legislators to the U.S. before to try to persuade Congress about pending legislation. But sending a delegation to Washington to discuss Syria’s civil war could be seen as a publicity stunt, given the strong positions Moscow already has taken as a key ally of Syrian President Bashar Assad‘s regime. The U.S. has accused Russia of providing military support to Assad that has allowed Assad to cling to power during Syria’s civil war. The across-the-board federal budget cuts known as sequestration will hurt everything from the local barbershop to the largest manufacturers in Northeast Pennsylvania, said members of a panel at Sen. Bob Casey’s office Friday in downtown Scranton. With no deal between Congress and the White House in sight and just hours before sequestration kicked in at midnight, the Democratic senator and a cross-section of local civic leaders struck a dire tone. As the furloughs and cuts begin, sequestration will have an immediate impact not just on the government employees, but on contractors, and the communities where they live and spend. The U.S. economy survived the plunge off the so-called fiscal cliff only to find itself in hot water. A last-minute tax hike rescue by a reluctant Congress meant there was no room in the legislative lifeboat for addressing the debt-ceiling fix, spending cuts or the deficit. An increase in wage taxes was ballast for the end of Bush-era tax cuts for the wealthy. The biggest hit to Berks County residents and small-business owners comes in the form of the 2 percent wage-tax hike, which translates to a cost of about $1,000 for the average family. WASHINGTON — Working against a midnight deadline, negotiators for the White House and congressional Republicans in Congress narrowed their differences today on legislation to avert across-the-board tax increases. At the same time, Democrats said the two sides were closing in on an agreement over taxes. They said the White House had proposed blocking an increase for most Americans, while letting rates rise for individuals with incomes of $400,000 a year and $450,000 for couples, a concession from President Barack Obama’s campaign call to set the levels at $200,000 and $250,000. WASHINGTON — The U.S. economy added 146,000 jobs in November and the unemployment rate fell to 7.7 percent, the lowest since December 2008. The government said Superstorm Sandy had only a minimal effect on the figures. The Labor Department‘s report today offered a mixed picture of the economy. Former Philadelphia Eagle Big Jon Runyan is being wooed by the Burlington County NJ Republican Party to run for a seat in New Jersey’s 3rd US Congressional District. The district includes most of Ocean County and Burlington County, NJ. Jon would be taking on Democratic incumbent John Adler. Runyan is not affiliated with either major party. The 3rd District hasn’t had a Democratic Congressman in over 100 years until Adler defeated Republican Chris Meyers last November. If Arnold can be the govenator, we can have a former Philadelphia Eagle in the US Congress.